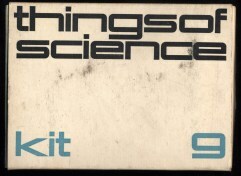 For many years, the Science Service produced a monthly series of science kits called "Things of Science", available by subscription. 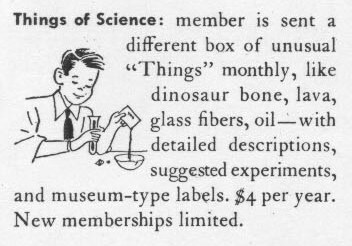 When I was a kid (in the 60s), I subscribed to Things of Science for several years. I suspect that many of us who chose careers in the sciences found at least part of our inspiration in those blue boxes that arrived in the mail every month (well, almost every month; sometimes we'd get manila envelopes, filled with stuff that wouldn't fit in the boxes). Each kit ("unit") had a booklet of experiments, and usually everything needed to perform them. The original mission of the Science Service, a nonprofit organization founded in 1921 by newspaper publisher E. W. Scripps (1854-1926) and still active today as publishers of Science News, was to educate the public about science, principally as a news service, by providing articles describing current research to newspapers and popular magazines. The Things of Science program, which was launched in November 1940, was the brainchild of Watson Davis (1896-1967), director of the Science Service from 1928 until 1967. Interviewed in a 1946 Wall Street Journal article, Davis traced the beginnings of Things of Science to samples of new materials sent out with Science Service news stories as an attention-getter. "It was [Davis] who dreamed up the little packages that make every man a museum head who wants to be. The first ones were sent to newspaper editors to help sell natural science stories," wrote Herbert Nichols, science editor of the Christian Science Monitor, in a 1952 article about Things of Science. Early in the program's history, the emphasis shifted to young people. Already in 1946, the Science Service estimated that half of its subscribers were school groups and science clubs, and the other half individuals. Things of Science brought journalists, teachers, and students alike in direct contact with not only the ideas but also samples of the actual stuff (unusual and often new materials) that researchers were inventing or studying. The early boxes were light brown. The first of the familiar blue boxes appeared between October 1943 and September 1944. The wartime units provide intimate and often startling perspectives on their period. The samples in the Unusual Fabrics Unit of September 1942 were described as materials "of special value now because of war shortages and of promise for the days after the war when industrial progress will usher in many new products;" how must it have felt to handle and study these swatches of otherwise unattainable luxuries? A year later, the Cork Products Unit recruited subscribers to a grand project to survey the US for wild cork oaks, since the supply of Spanish cork was uncertain during World War II and finding a native supply was a priority. Since the program relied on donated materials, the Science Service limited the number of subscriptions, initially to 1,000, but increasing to 5,000 (with a waiting list) in 1944, 7,000 in 1946, and 12,000 in 1952. In 1957, support for the program allowed the Science Service to expand the number of subscribers again, as noted in this flyer about the program. The Science Service produced and distributed Things of Science for about 40 years, through 1980. In 1981, the Science Service transferred its rights in the program to an independent company that produced additional units until at least 1989. The owner during at least part of this period was Andrew E. Svenson, Jr. (1939-2005), whose father was a noted author of children's books. The Science Service has reacquired rights to Things of Science and may revive the program at some time in the future. 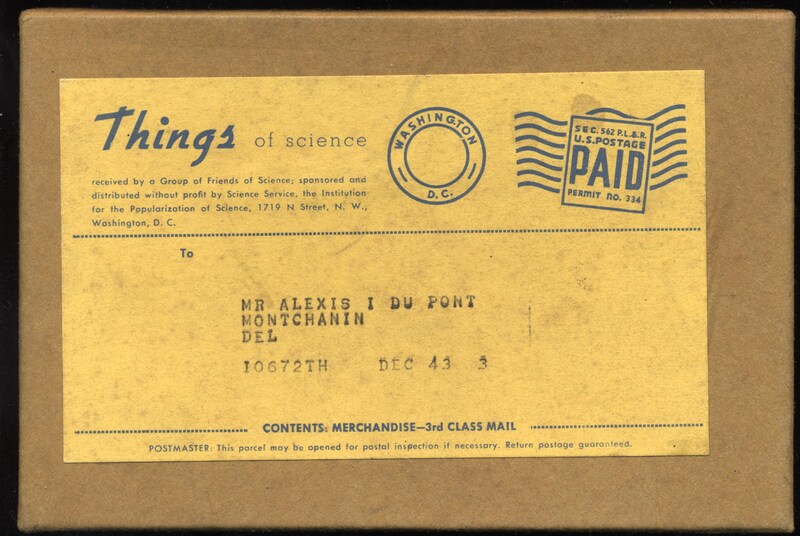 Box 306, folder 10: England - Science News Letter, "THINGS of Science," and Science Talent Search, 1948. Efforts to duplicate Science Service activities in England. As noted below, an independent UK-based Things of Science program appeared during the mid-1960s. On 10 January 2008, the Science Service became the Society for Science and the Public. First, some general information I've been able to glean from looking at many units. The first 338 units (created between 1940 and 1968) were consecutively numbered, although the numbers did not appear in the first 20 (possibly as many as 22) units. 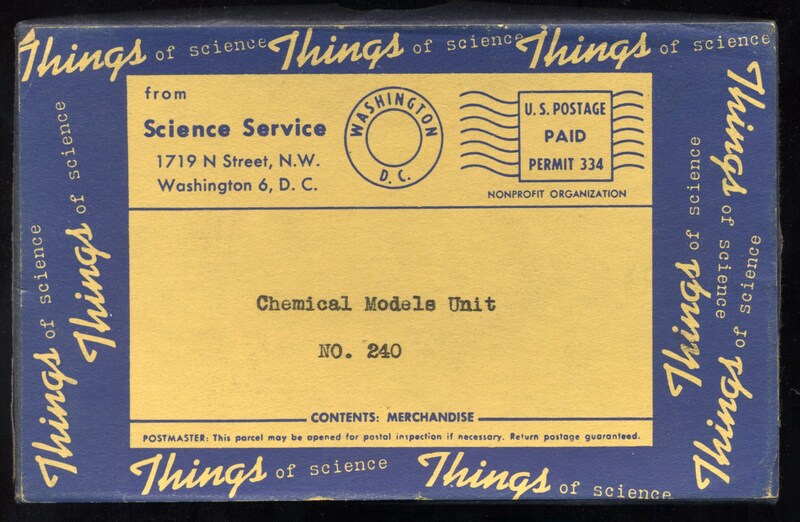 An extra unit, numbered 25A (Nylon Monofilament Unit), was issued together with unit 25 (Resin Bonded Plywood Unit), and subscribers apparently received both units together in one envelope. Units issued in 1969 and later years were not numbered, and it can sometimes be difficult to establish even the year of their production. The mailing labels on most units indicate the expiration date of the subscriber's subscription, and not the date when the unit was produced or mailed. Both 1-year and 2-year subscriptions were offered at various times, so it is reasonable to assume that the production date of an unknown unit was at some time during the two years prior to the mailing label date. The copyright date on the booklet indicates the year (and in some cases, the month) of production. The table below indicates the production dates, where known; units were usually received by subscribers during the month following the production date, but sometimes much later (since it was possible to order extra units when available). The dates for the unnumbered units have been discovered from a variety of clues, but there is some uncertainty about them and most of the unnumbered units are only dated by year. At the end of the table below, I've listed in italics titles of units that I haven't examined myself, for which the dates and in some cases the titles are uncertain. In a few cases, I found these titles in the booklets provided with later units; others have been sent to me by readers of this page (see below) or have been found in references elsewhere on the web. 12/79 Matter: What Is It? 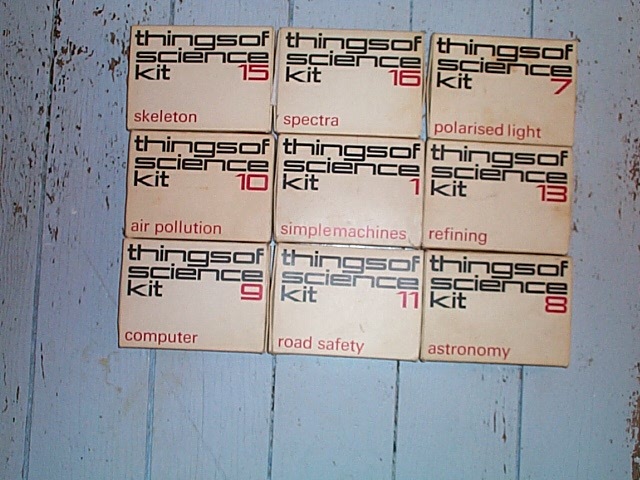 During the late 1960s, Geoffrey Young ran a UK-based "Things of Science" program for ACE (the Advisory Centre for Education, based at that time in Cambridge), which produced a series of at least 16 kits in 1966. Tien Bryan sent me a photo of nine of these kits from 1966, which came in boxes with imprinted titles and numbers. The first section of the table below catalogs his collection. It appears that at least 12 of these kits were reissued between 1966 and 1968. My own collection includes 11 kits dated 1966, 1967, and 1968, which came in boxes with imprinted numbers only, listed in the second section of the table below. Since the numbers do not appear on the instruction sheets or elsewhere in the kits, their association with the kits is uncertain, and I suspect that the boxes on my kits may have been shuffled long ago; in particular, based on the dates, it seems likely that the Chemical Indicators kit currently housed in box 2 may have originally been supplied in the missing box 11. 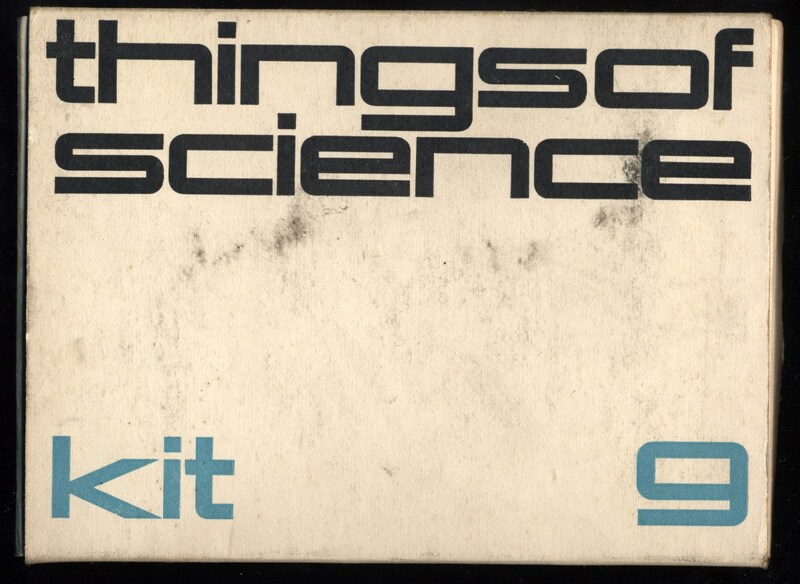 Although several of the titles and some of the materials also appear in the Science Service's Things of Science, the accompanying experiments are different, and it appears that instruction sheets included in the ACE Things of Science were written specifically for those kits. My wife and I met as students at MIT in the mid-1970s (I studied physics, and she studied mathematics and biology). We have three kids who all share our love of science, engineering, and mathematics. I was disappointed to discover, when our oldest was about the age to start enjoying Things of Science, that the program had been discontinued, and (worse) that my mother had tossed out all of my old Things of Science (although she kept the flower pot I made from a tin can and a bunch of clothespins, for reasons I didn't understand until I started collecting my own kids' creations -- but I digress). Since I was at MIT, our kids were certainly not science-deprived, but it nagged at me that there really was nothing quite like those blue boxes for them, a bit of mystery to unravel each month. A few years later, along came the Web, and eBay, and then (seemingly) everything that anyone had ever thought to collect was available again. It has been great fun to rediscover (and to learn more about) this wonder of my childhood and to share it with my kids. And sometimes I let them open the boxes first. Naturally, I wanted to learn everything I could about the program, and I began compiling a list of Things of Science units (above). As time permits, I am adding additional information about the units, including their contents, notes about the experiments, and current sources for replacement materials. I've checked the information posted here carefully, in most cases with reference to kits I've been able to examine. Entries in italics are from information supplied by readers of this page, and have not been checked further. Thanks especially to Ivars Peterson for sending me notes written by Richard Wayne Bush about his family's collection of Things of Science spanning three generations, which provided many of these unchecked listings. Other readers who have contributed information and recollections include James Benton (whose question about Computation Unit 209 prompted me to begin work on this page), Jim Buhrman, Tom Fredette, Karl Gardner, Dan Geer, Rebecca J. Goetz, Carlo Milono, Dale Schubert, Kathleen Smith, Andy Stevens, and Ron Zilli. Additional information and corrections are welcome and will be gratefully acknowledged here (please send email about this page to georgebmoody0 at gmail dot com). In addition, I will send a Things of Science unit as thanks to the first reader who sends me readable scans of the booklet or instructions and photos of the contents of any unit not listed above, or for any of the units listed in italics. Last revised 27 August 2017.